The 2120 Series Programmable Logic Control Interface Module is an accurate, absolute position sensing device for use with rugged, noise immune transducers in harsh environments. It can be used as a simple indicator of position or as a PLC Interface Module generating digital signals, as well as serial and analog outputs to feed PLC’s. 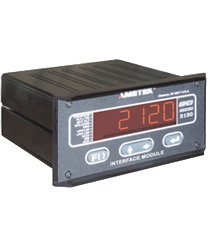 The 2120 is a modular system is designed to use our Resolvers or Digital Linear Transducers. There are three optional slots in the controller that can accommodate Analog, Digital or Relay Outputs (Upper & Lower End Limits). These optional features can be used to interface positional or velocity data back to a PLC or host controller. The 2120 unit can be used with our 1986 Series Resolver Assemblies, 955D Brik Series Linear Transducer, 953D VMax Series Linear Transducer, and the 952D BlueOx Linear Transducer.